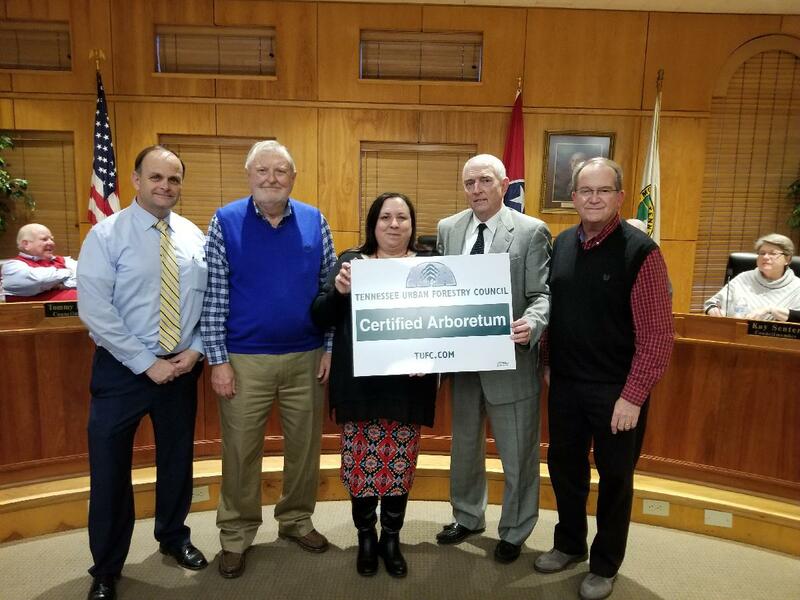 At their meeting on January 2nd, the Mayor and Council recognized members of the Tree Board for their work with the arboretum. The Fred Miller Park Arboretum is located near downtown Morristown, Tennessee, along the Greenway, which connects city parks. The 18.5 acre park boasts a wide variety of native and planted tree specimens, so an arboretum was a natural fit. Fred Miller Park is a popular site for walking, playing, family gatherings and organized events and lies on the site of the former Rheatown neighborhood. Urban renewal projects of the 1960's modified and encased the creek through downtown to control flooding, built Morristown’s famous SkyMart to promote economic development and created the park for public enjoyment. The park is named in memory of Dr. Fred Miller, a local dentist who practiced from the 1950's to the early 1970's. His compassion for the needy led him to treat the dental needs of the children of Rheatown, often before treating his regular patients, and to give food and clothing to their families. He was active in political and civic organizations and in his church. When the park was created from the remains of Rheatown, City leaders named it for the man who cared so much for local children. The arboretum was originally conceived and designed in 2003 in conjunction with the first year Morristown was designated a Tree City by the National Arbor Day Foundation as a diverse botanical area designated for the study and enjoyment of trees. Some mature native trees many years old were identified and labeled while some new trees were planted in 2003. Many of the trees then planted are now thriving. Other trees have been planted in the intervening years, so the arboretum showcases a great variety. Thirty-one distinct varieties of trees are labeled with silver nameplates designating their common and scientific names. Many Arboretum trees are located near the looping and winding paths that cross Turkey Creek twice and follow the creek along the Greenway. Turkey Creek roughly bisects the park diagonally, then flows north underneath the city’s downtown shopping district before ending at Cherokee Lake. The creek has many varieties of trees along its banks including weeping willows and river birches. Other Arboretum trees are scattered throughout the park, along the park perimeter or in the newly acquired southwestern corner of the park which boasts some of the oldest and grandest trees around- including an enormous Eastern White Pine most likely more than a century in age. Visitors to Fred Miller Park Arboretum will experience an oasis of nature in a beautiful setting- right in the heart of the Central Business District.